A post of a different kind today. Not beauty, not my outfit but the thing that just may trump it all - FOOD!!! If you follow me on Instagram (do it. all the cool kids are. @alittlebitetc), you know that I love to chow down. Heck, I even have an entire hashtag dedicated to it - #albetceats. 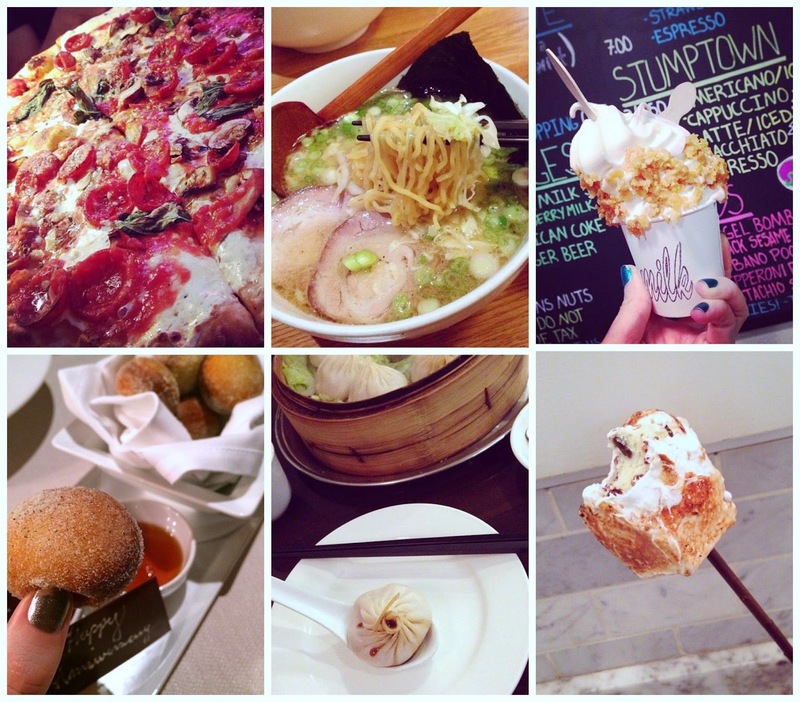 Desserts, ramen, pizza - it's all good to me! One of the best parts about living in NYC is the exposure we have to so many great places to eat. I decided to compile some of my favorite and/or most visited restaurants. I plan on making this a regular series so stay tuned for more recommendations over the next few months. No, this will not turn into a food blog, but like makeup, when I find something great I feel the need to share it! If you are not hungry before reading this, you may be after. 1. Marea - I will start with the splurge of the bunch - this place is truly mind blowing. We went there for our wedding anniversary recently and could not stop raving about it weeks later. Marea is a seafood restaurant with some of the freshest fish you may ever eat - with stunning presentation and even more impressive decor. We began with a crudo tasting that was so fresh it almost swam off the plate, and then had a whole branzino for dinner. Ex-cell-ent. And because I can never say no to dessert - I got the bombolonis and thought I would never eat a better piece of dough. The best part? It's across the street from central park so you can work off some of your dinner with a stroll through the park. 2. Momofuku Milk Bar - Yes the lines are long. Yes the hype is huge. But is it all worth it? You bet your sweets loving behind it is!!! My husband and I are such suckers for this dessert (and some savory) heaven that we try to get there at least 1-2 times a month. Their cake truffles are legendary (one of the first ingredients is butter - YUM), the cereal milk soft serve sends me into a fit of rage each time I finish it because I want more, and the compost cookies make me want to be a better person! Or at least be a more fit person who can reward herself with MORE COMPOST COOKIES. 3. Otto Enoteca Pizzeria - This restaurant is part of the Mario Batali empire, situated a block away from Washington Square park, has the most cozy but refined decor and some of the best pizza and Italian dishes you may ever eat - yet the prices are ridiculously affordable! Every time my husband and I eat here we say "how are these dishes so decadent and delicious yet so inexpensive?!" It's one of life's mysteries but I am grateful for it. Now what should you eat? Well whatever you darn well please, but here are a few of my favorite dishes. The spinach salad with ricotta salata and truffle honey is one of the best salads I have ever eaten. The pizza vongole is a pizza with clams on it. Clams in the shell. It's delicious and so unique. And the funghi and taleggio pizza makes my heart sing. Oh, and get like a gazillion antipastis to start. They are $6 and come in the cutest ramekins. But DO NOT leave there without trying the olive oil gelato. Just don't. 4. Trattoria Del'Arte - We stumbled upon this place based off a recommendation from a tourist actually. They were raving about how they visit this place every year because it has the best antipasto bar around. Boy were they telling the truth! This has become a regular dinner spot for my husband and me when we want to avoid the "scene", be casual and eat good food. We ALWAYS sit at the antipasto bar, and the selection is amazing. So many choices, fresh and seasoned perfectly - and they have an option to pick 6 and it comes with a homemade ball of fresh burrata mozzarella. I should warn you however, the ball of mozzarella is approximately the size of my fist and could feed a small army so come hungry, and just know you will be leaving with leftovers. 5. Ippudo - I was not particularly a huge ramen fan before I met my husband, but his passion for it is infectious and has rubbed off on me. I had heard of Ippudo for years, but knew more of their epic long lines rather than their actual food. But we were roaming around the area on a Sunday at 4:30pm, and realized this was the best time to try and get in without waiting the standard 2 hours. The restaurant opened at 5pm, so we headed over and of course there was already a line forming. But it was well worth it. I am by no means a ramen expert so I wish I could expound upon what exactly makes it so good, but I really don't know. It's just yummy. I got the Akamaru Modern mainly because it comes with garlic oil and I live for all things garlic. But before you get to the slurping, you MUST order the steamed pork buns (or chicken, your preference) and try to keep your cool. Try not to eat them, hug your waiter and then running around the place screaming "more buns, more buns, more bunssssss!" Try to eat your meal with some dignity, no matter how much it's deliciousness makes you want to lose your mind. Now there are just a small selection of some of my favorite restaurant spots. Stay tuned for more posts in the coming months with more recommendations.